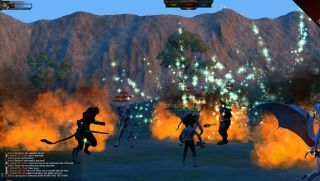 The Camelot Unchained Kickstarter was a close thing, but it ultimately managed to make it across the line with more than $2.2 million. That's perhaps less impressive than it might sound, given that the goal was $2 million, but MMOs aren't cheap to make, and the studio behind it, headed by Mythic Entertainment co-founder and former CEO Mark Jacobs, is clearly aiming for a 'big game' experience. As an "engine/tech alpha demo," the video isn't as pretty or refined as it could be, but it does show off an impressively large number of people of various races battling inside and outside large castles. There's also some character creation to look at, a bit about building in-game structures with CUBE (Camelot Unchained Building Environment), and a big, green duck. I'm not sure what the deal with that is. A breakdown at the very end of the video explains a bit more about what Camelot Unchained actually is. "A TriRealm, RvR, true sandbox game, set in a persistent, open world," the insert states. "A game that is all about the fun of conquest and defense; not a gear, progression, or achievement grind." The engine is designed to support battles of more than 400 players in small spaces, and players will drive the economy by doing virtually all the building and crafting. Surprisingly, and perhaps optimistically, it will also be subscription-based, "with no cash shop, no content unlocks, and no content hidden behind a paywall." Testing is ongoing, but no release date has been set.